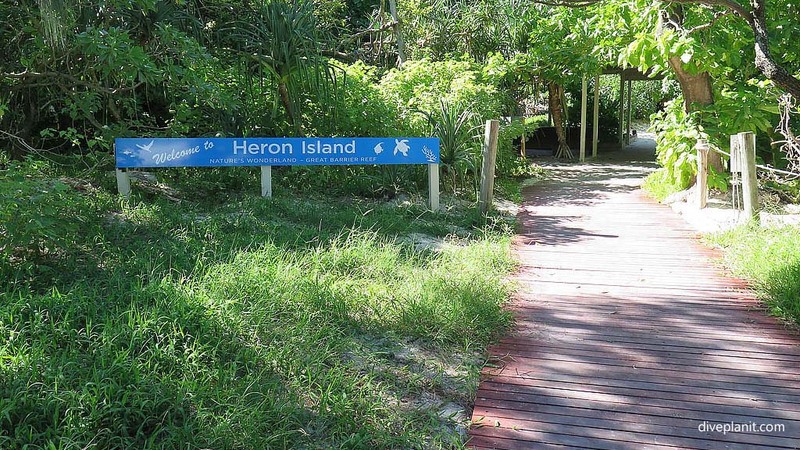 Heron Island is a coral cay on the Southern Great Barrier Reef. 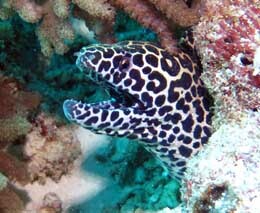 It has a modern resort and Heron Island Dive Shop has everything you need to enjoy diving Heron Island. 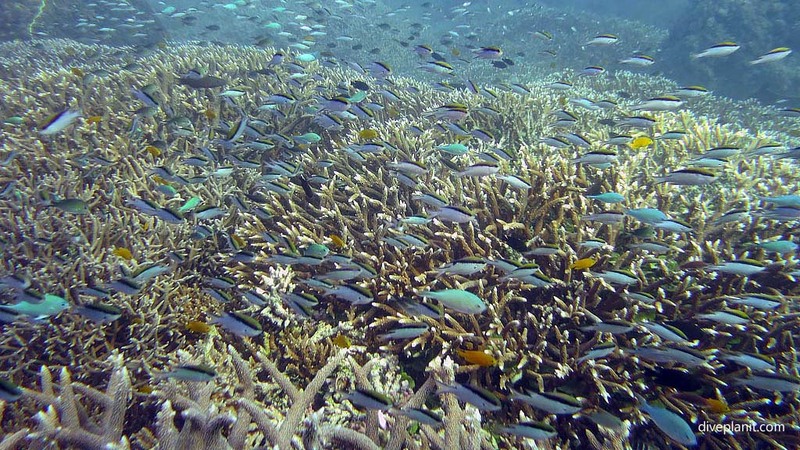 Heron Island is completely surrounded by coral reef which is accessible by reef walking, scuba diving and snorkelling. 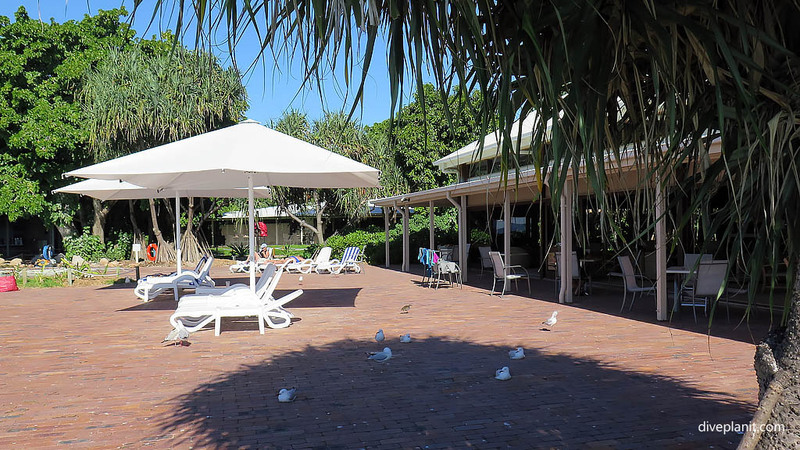 Heron Island Resort has 109 rooms, a bar, restaurant and all the facilities you would expect of a modern resort such as a pool and meeting centre. All in water activities are run from the Marine Centre, and these include diving and a semisubmersible reef viewing boat. 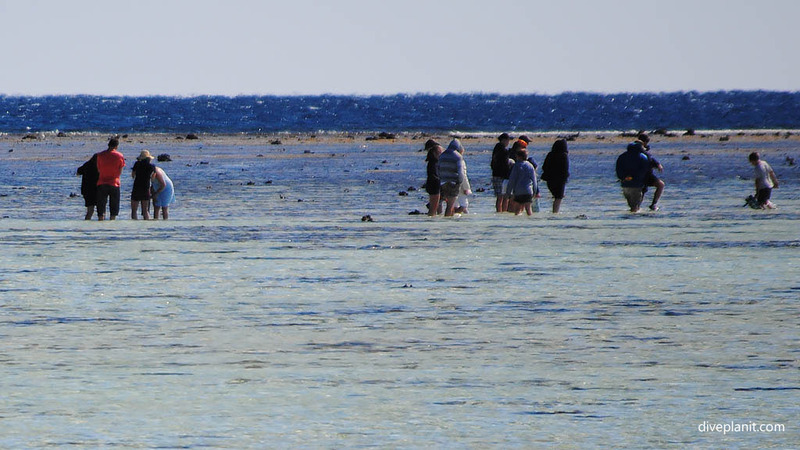 There are a number of nature based activities such as reef walking and bird watching arranged via the Information Centre. The island’s nature calendar includes the nesting and hatching of turtles, the nesting and hatching of sea birds and hump-back whale migration. From a diving perspective it’s paradise: three dives per day, plus night dives, in reasonably shallow clear water, with most dive sites just minutes from the jetty. 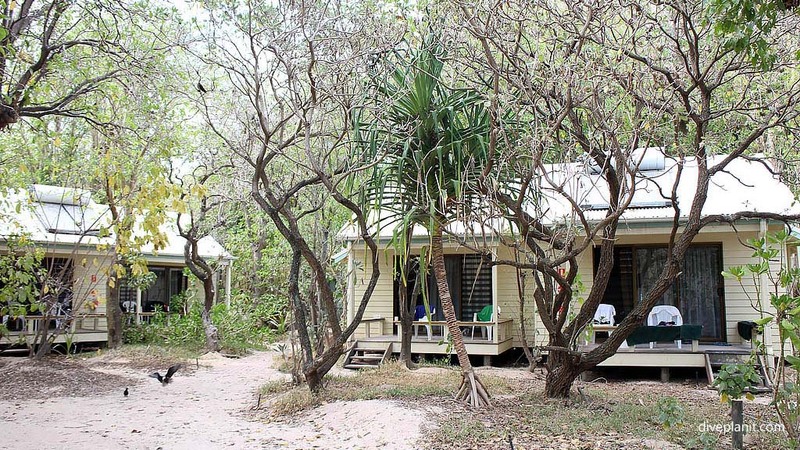 Heron Island is located 82 km north-east of Gladstone on a coral cay. 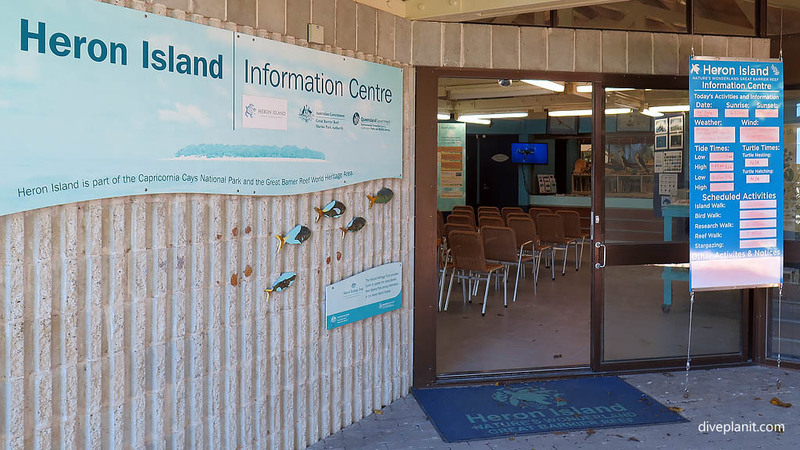 The Marine Centre is the Heron Island ‘dive shop’. It’s the place where you book in for all watersports (including the semi-submersible trip), and hire any gear you need. Get all the detail via the link below. 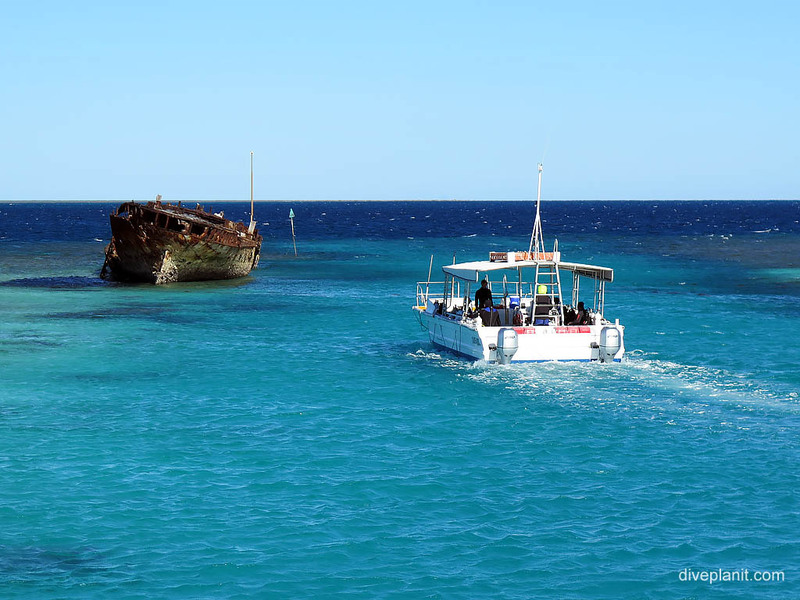 There are dive sites all around the reef that surrounds Heron Island, and the adjacent Wistari Reef, so there is always a suitable spot whichever way the wind is blowing. The sites are imaginatively named after the features of the reef near the moorings that mark them and include lairs, cascades, bommies, holes, pools, grottos, gullies, canyons, points, peaks and gardens! The signature dive is Heron Bommie which is due west of the island and almost the closest dive site. In addition to the Heron Bommie dive, the other two dives below are both on the northern edge of the reef. 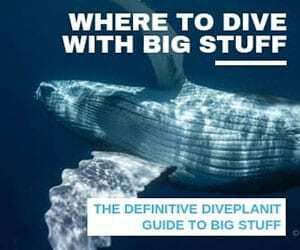 From a diving perspective, I would recommend getting a diving package and seeing what accommodation options are available with it. 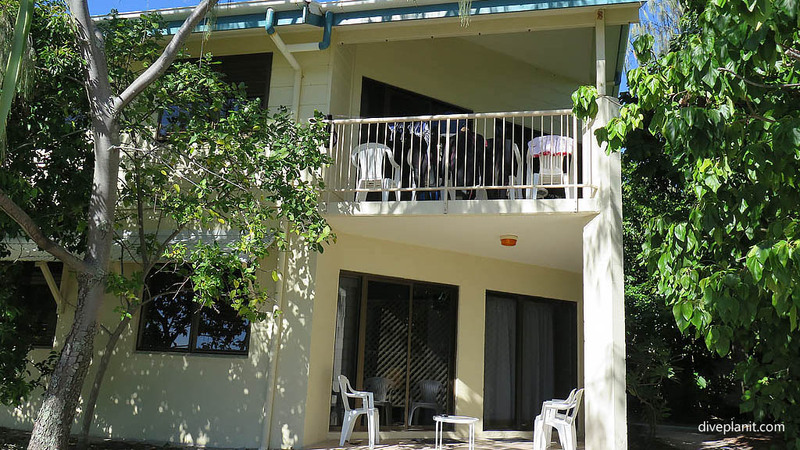 All rooms have a balcony or terrace – essential for drying your gear, and quite honestly, do you really need a view of the reef from your window – you’re going to be out on it most of the time. Still, there may be others in your group who want a little luxury, or direct access to the beach if that’s where they’ll be spending their day, while you’re out on the boat. Bottom lines: there are plenty to choose from; it’s all good; you can even check into your room at the Marina in Gladstone before you get on the ferry. 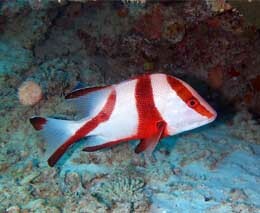 There are specific 3, 5 and 7 day packages advertised for divers so check out these first. 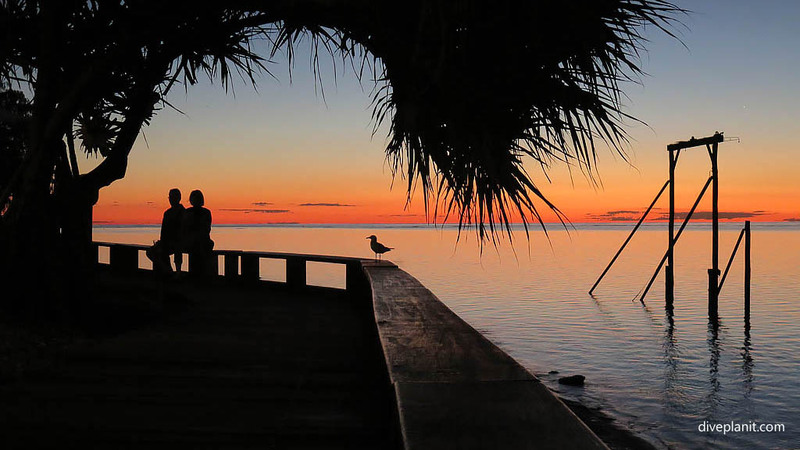 Check availability with the Heron Island Resort directly. 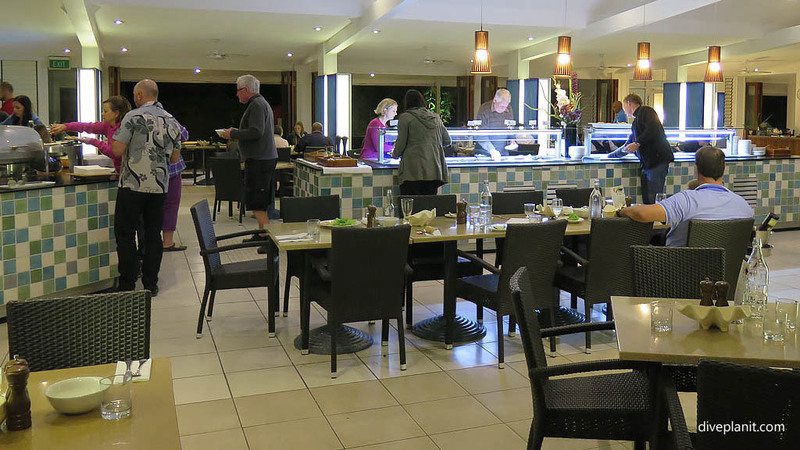 The Shearwater Restaurant is the eatery – though some food is served at Baillies Bar. Breakfast is served as a buffet, lunches are a la carte, and dinner is also a la carte apart from the Friday and Saturday evening themed buffets. The resort will allocate you are dining slot on the à la carte evenings so that there is not the long wait that there would be if everybody decided that 7pm was their dinnertime. You can book a specific slot in advance though if you choose. 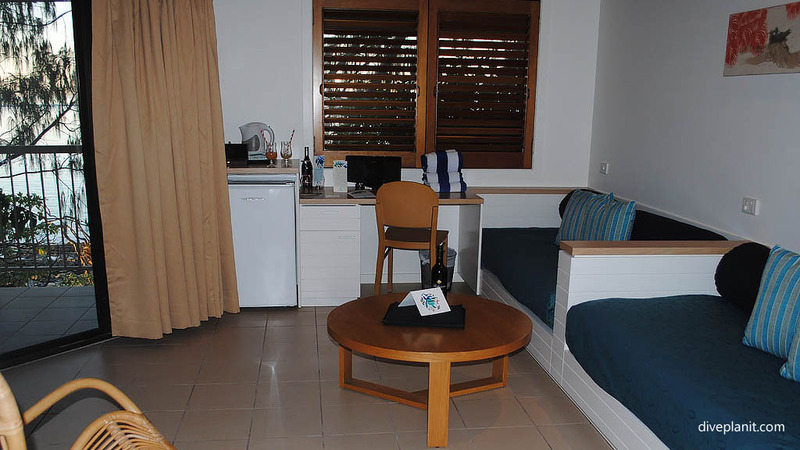 The accommodation packages can be taken as inclusive of breakfast or, all meals. 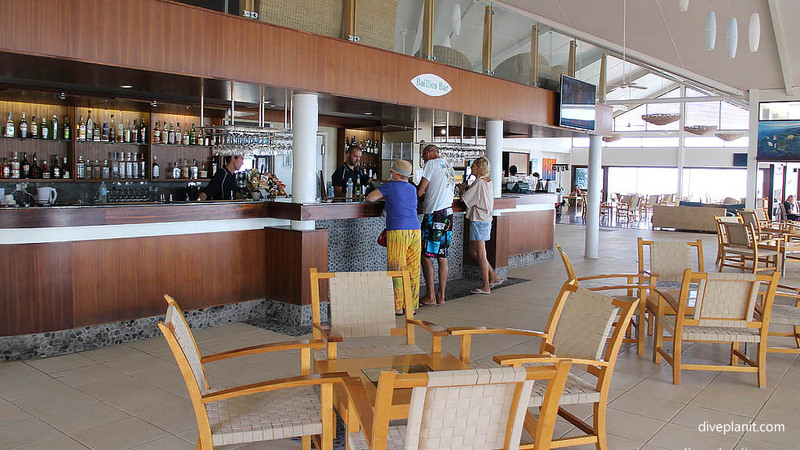 The restaurant has an extensive Australian beer and wine list and as it is a resort you are not permitted to take your own alcohol (or indeed food – there are no self-catering options). Bailies bar has live music most evenings, two pool tables, and an excellent choice of beers on tap at reasonable prices. The pool is right next the bar so you can safely watch the kids enjoy a drink and the fantastic sunsets. About an hour before which the bar terrace which overlooks the lagoon has the most beautiful light – perfect for photography. Check the Heron Times – published daily. Activities are pretty much the same each day, so don’t worry if you don’t have today’s edition. The following daily activities are complimentary. 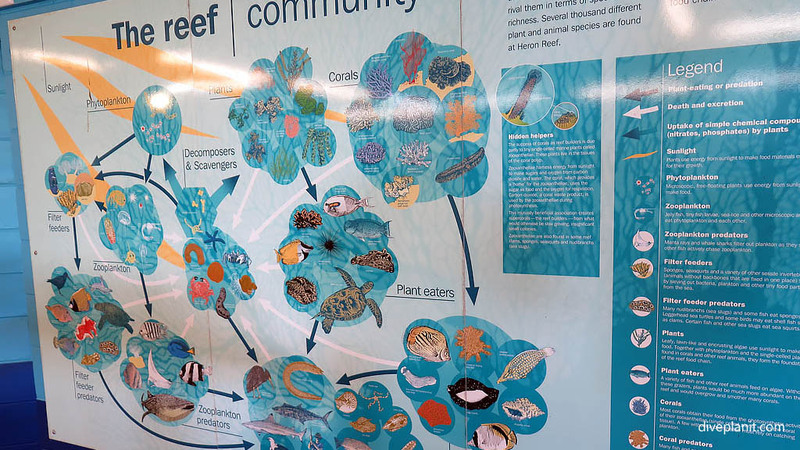 Research Walk: this is a guided tour through the University of Queensland’s Research station. The world-class research and teaching facility is the largest island research centre in the Southern Hemisphere. Snorkel lesson: join a 15 minute snorkel lesson (– though as a diver you should be giving the lessons if any of your mob need them). Bird walk: learn about the many birds that are encountered on the island, including the residents, those that come just to breed like the terns and shearwaters, some migratory waders that come to escape the miserable northern winters, and local visitors from the mainland. 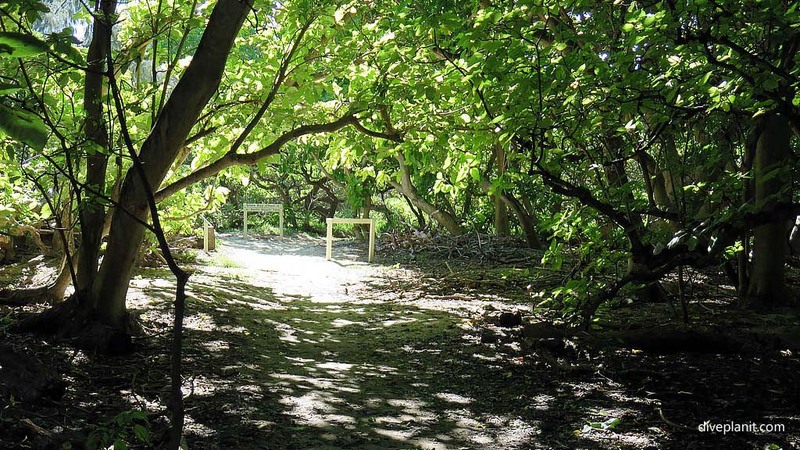 Island Walk: there are walking tracks which wind through the bushy centre of the island to each of the different beaches and reefs. Depending on the weather, there may also be stargazing at the helipad after-dinner; a nature-based talk on some specific aspect of Heron’s ecosystem or a sunset cruise. The Information Centre: don’t forget to check out the information centre as soon as you can. 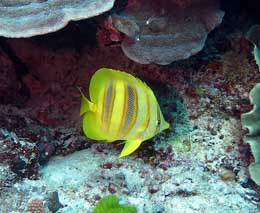 You’ll learn a lot of useful background information about the island and the reef ecosystem. The following activities attract a fee. Semisubmersible: this is not your average glass bottomed boat trip. 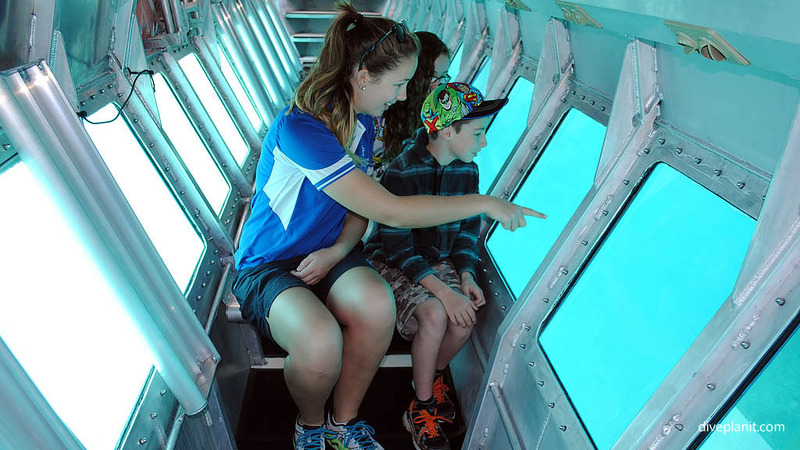 The boat in which you sit has a fully submersed lower section (which is covered overhead) so that you can see through the glass side panels and have a very clear and undistorted view of the reef and the amazing fish life to either side. Bookings via the Marine Centre. Kayak hire: hired by the hour, near the jetty, you can grab a kayak to paddle around the lagoon during the afternoon hours. 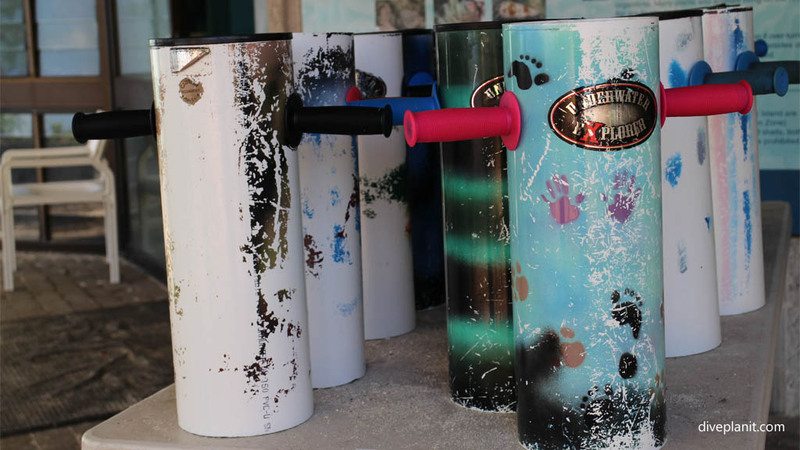 Junior Rangers: ditch the kids and go and have a dive (or a rest). 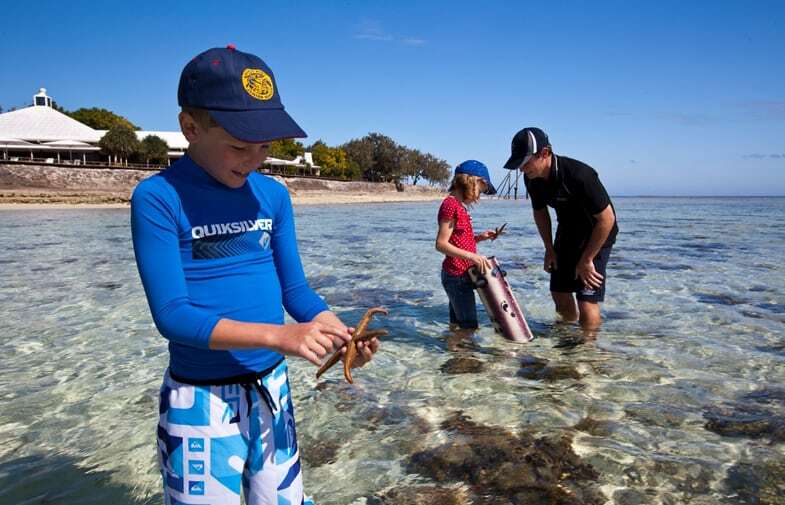 The Junior Rangers program was developed by Heron’s team of marine biologists and naturalists with some help from the University of Queensland and is designed for kids aged between 7 and 12 years old. For $15 per child, per session, the kids get a Junior Rangers workbook, hat and get to earn embroidered badges by completing various tasks. For younger kids, there is safe paddling or swimming in the shallow lagoon or swimming pool. Whale watching (in season): The whales that pass by Heron are Hump-backed whales – named after their small, but pronounced, dorsal fin. Reaching up to 16m in length and weighing up to 50 tonnes, they can be seen breaching from the jetty and shore line. June is the best time to watch for whales heading north to their tropical breeding grounds; September is the best time to see them heading back down south to their feeding grounds around Antarctica. 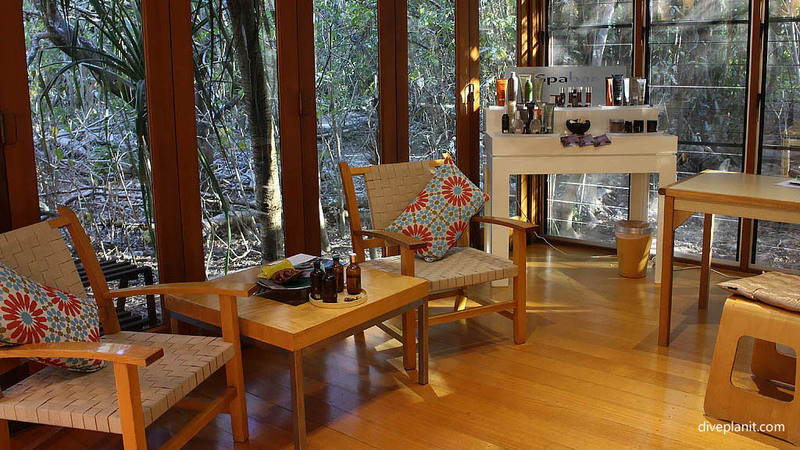 The Aqua Soul Spa: if you feel the need for a little pampering, book in for a facial, a Pedi or the works at Reception or at the Spa directly. If you’re not sure what to choose, join the daily 15 minute tour from 4pm daily. 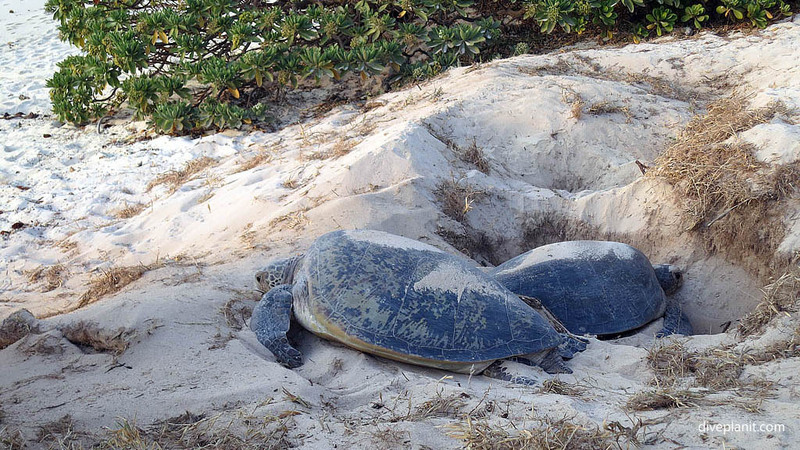 Turtles: Turtle nesting takes place between November and March. Turtles can be found simply by walking along Heron Beach one or two hours after the evening’s high tide. Look for the tracks in the sand where the turtle has come in from the sea. 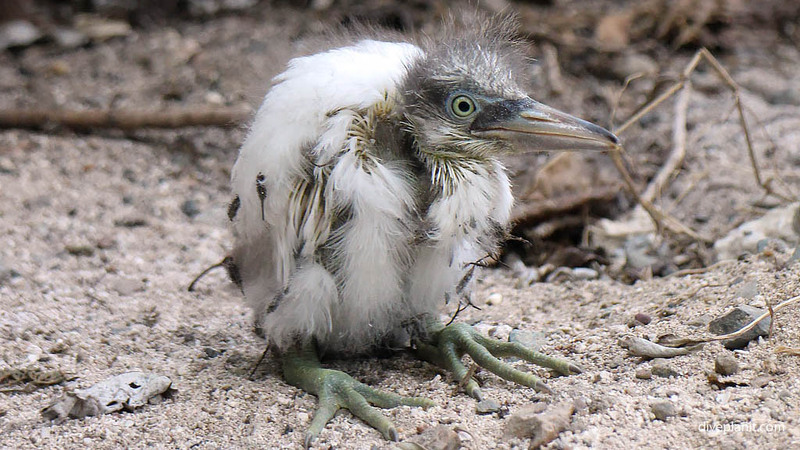 Hatchlings appear two months later (between January and May), again usually after dark. When the hatchlings emerge from the sand they use light horizons to navigate out to sea. If bright artificial light is present, they will get confused and may head toward it instead of the ocean. 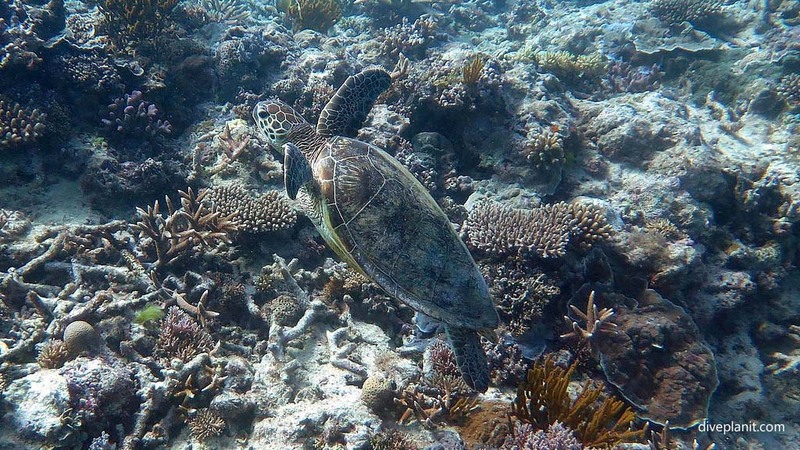 In order to not disrupt their habitat, nesting habits, or the behaviour of hatchlings strict guidelines are in place for the viewing of nesting and hatching turtles. Please ensure you are aware of these guidelines before you head off to observe this natural phenomenon. Of course, you can make up your own activities or just enjoy the island and beach on your own. It’s the divers’ dilemma that the clearest water is always the coldest. Here are the average temperatures in centigrade. 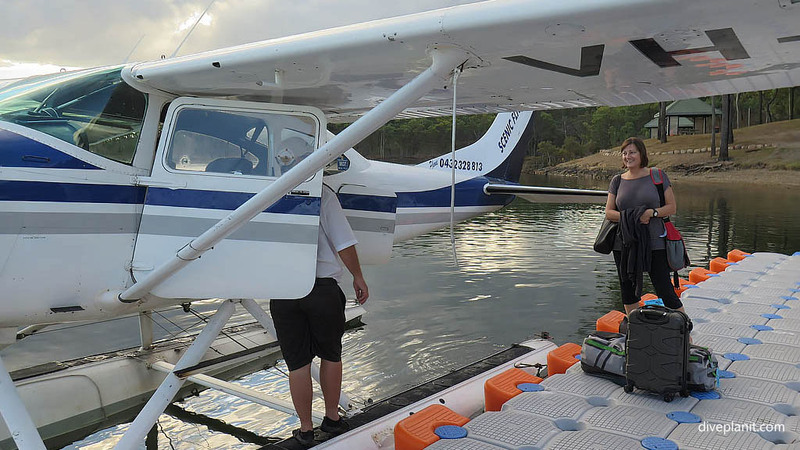 There are two options for getting to Heron Island from Gladstone: the Heron Islander boat and by air. (Both Virgin Australia and Qantaslink fly to Gladstone). The Heron Islander is a large (34m) comfortable boat with a bar, and usually a movie for the kids. It has two deck levels, and inside (air-conditioned) and outside seating. 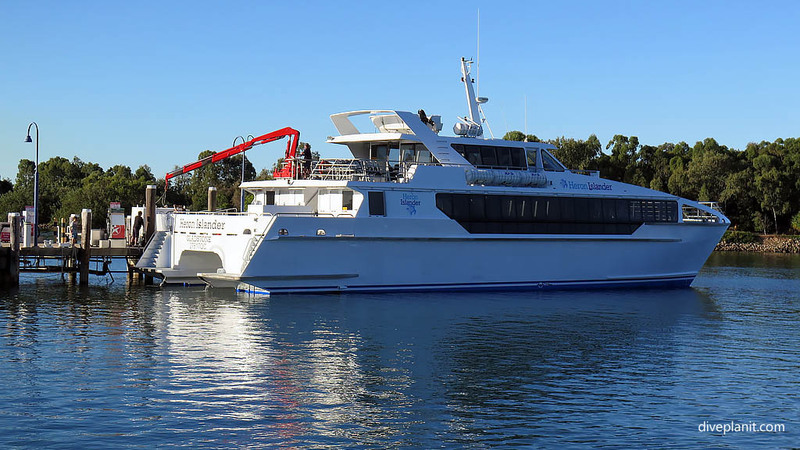 The boat travels to Heron Island and back 11 days out of every fortnight. Departing the Gladstone Marina at 11am arriving Heron at 1pm, and departing Heron at 2pm arriving back at Gladstone around 4pm. There is a coach connection from the airport departing 10.15 am directly to the Marina; and another that transfers from the arriving boat back to the airport arriving just before 5pm. You will need to ensure your flights fit within this schedule, allowing a little contingency time for possible delays. 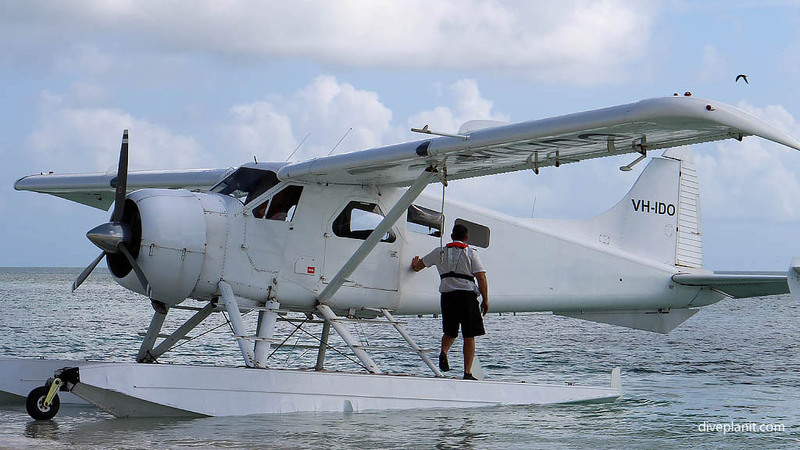 The alternatives to the Heron Islander are the seaplanes operated by Australia by Seaplane, or the helicopter. 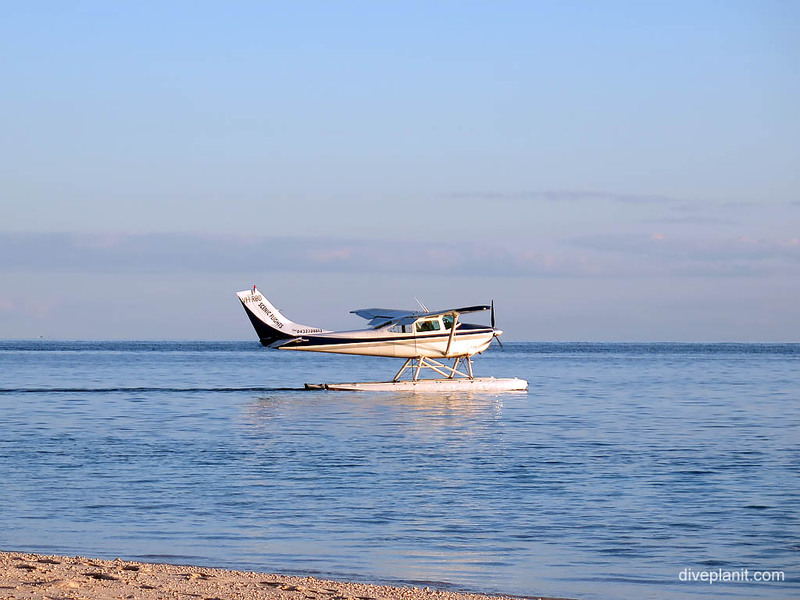 There is no airstrip at Heron, so in-coming flights land on the water in the lagoon adjacent the jetty and depart as soon as they have deposited or collected passengers. This means that flights are weather and tide dependent, as they need enough water to land and take off again on. 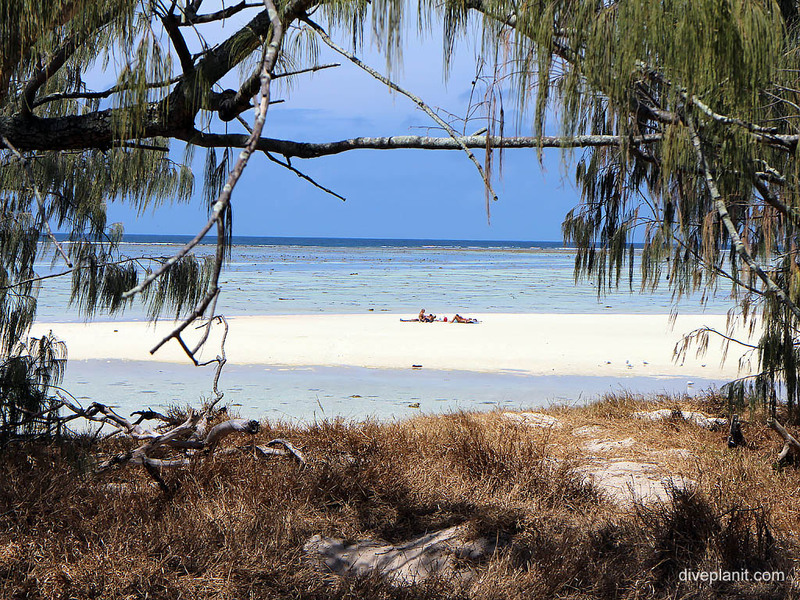 It also means that you will need to wade ashore at Heron Island so wear shorts and sandals for the trip. It’s a very scenic 25-35 minute trip though, so you should have your camera handy throughout. 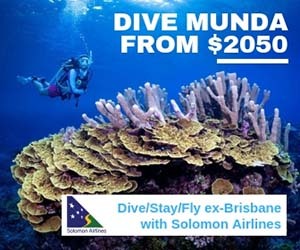 There are two planes – one which departs from Bundaberg Airport, and one which takes off from Awoonga Lake which is a 30 min drive from Bundaberg airport, the transfers being included in the price. The planes only take three passengers, so it is pretty much your own private charter. The standard luggage allowance is 15 kg per person. The helicopter transfers are operated by Heli Reef, and dependent on availability, can be arranged to work around your other travel requirements. The baggage allowance is 15 kg per person, but additional luggage can be transferred via the launch the day prior at no additional charge. You can mix and match your arrival and departure methods, though it you are going to do this, you will need to probably need to speak to a person rather than attempt to book on-line. Though you can charge everything to your room for your stay, take some cash to cover your last lunch after you’ve checked out.